"WRI produces maps, charts, data sets, infographics, and other visual resources as part of our commitment to turn “information into action.” These products are based on our data and research, which are held to traditional academic standards of excellence, including objectivity and rigor." CIESIN provides information that would help scientists, decision-makers, and the public better understand the changing relationship between human beings and the environment. You can browse their data through 13 major categories, or a variety of other tools and collections to access their data and reports. CIESIN is a unit of Columbia University, and offers links to other research affiliates. GOSIC facilitates the search of and access to data, data products, metadata and serves as a portal to a wide variety of climate related data such as Global climate; Global atmosphere; Global oceans. The GOSIC Portal does not hold data, instead it maintains information about the datasets and products and points to the centers holding them. Up to date look at current conditions, daily forecast, radar images, and satellite images compiled from the Portland office. These regional reports include "red flag" warnings, and hazardous conditions, as well as wind warnings for more than a 100 mile radius from Portland Oregon. US-EIA offers access to a very wide ranging collection of data of energy production, consumption, peak capacities, distribution, discharges, pollution and costs, of current conditions as well as historical trends. Also offers forecasts and analysis. Includes all forms of Petroleum fluids, Natural gas, Electricity, Coal, Nuclear, Hydro, Wind, Solar, Renewable and Alternative sources. Coverage is US and the world. Use the Earth System Research Laboratory (ESRL) Global Monitoring Division site to find specific atmospheric data files. You can also browse the GMD ftp server. Navigate through the criteria to narrow your selection of data. For example, click on Greenhouse Gases as your main category, and then choose Carbon Dioxide as the type of greenhouse gas. From there you select how the air sample was collected, such as air samples collected in glass flasks, and how frequently the samples were collected (e.g. monthly). Your results then display specific locations around the world that meet these requirements. Note: These links go to pages that contain raw data. You need to copy and paste the data into Excel. The United Nations Statistics Division (known as UNSTATS) produces data sets on a variety of topics. Note: These files downloads in Excel file, but may be zipped due to the quantity of info it . Use the International Energy Database to locate data sets on world-wide carbon emissions from various sources. Use the Earth System Research Laboratory (ESRL) Global Monitoring Division site to find ozone data files. Navigate through the criteria to narrow your selection of data. The Climatological Data Annual Summaries include specific state data for total precipitation & departure from normal, average temperatures & departure from normal, temperature extremes & freeze data, monthly & seasonal cooling degree days, soil temperatures, pan evaporation & wind movement, & station index. 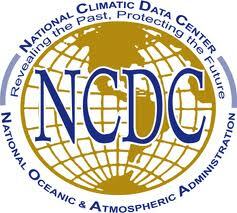 The data come from NOAA's National Climatic Data Center (NCDC) and the NOAA Regional Climate Centers. Daily data for individual sites is available for precipitation, high temperature & low temperature. Note: These data sets are in PDF format, so you will need to copy & paste the data into Excel. For local atmospheric data, the NOAA National Data Center (NNDC) Climate Data Online database is more involved, but very rich with data. 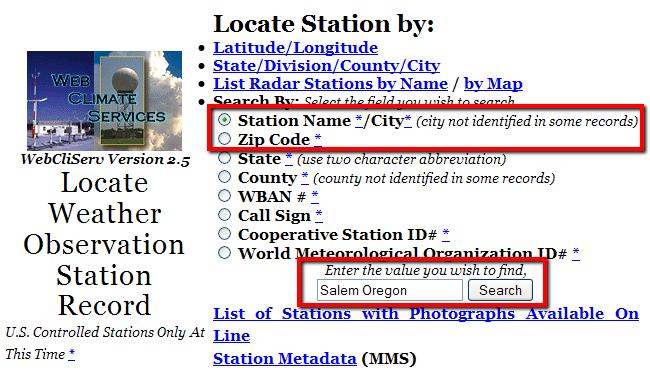 You can select data for a weather station or multiple stations for time periods you select. It covers precipitation, maximum temperature, minimum temperature, snowfall, snow depth, and more (data from each station varies). Click on the hyperlinked station number (left side of screen). From the drop down box called "Available Data from this Site," select SUMMARY OF ALL AVAILABLE DATA. On the page that opens up, select one of the options (e.g. monthly statistics). Notice that the data may not go back far. Check the "Discharge, Cubic Feet per Second" box and click Submit at the bottom of the page. On the page that opens up, from the output format options, select TAB-SEPARATED DATA and save the web page as a text file. Open the file you just saved in Excel.